As summer fades into autumn, the change in the weather can signal a change in potential hazards both in the home and garden. Identifying potential poisoning risks around the home and garden during autumn helps to safeguard all family members and ensures these tasks can be carried out safely. The cooler mornings provide ideal conditions for the proliferation of mushrooms and toadstools in fields and gardens. They can only be identified by an expert - some of the most toxic mushrooms look very similar to edible mushrooms. Even a small ingestion can be very dangerous. Never eat mushrooms you have not bought from a supermarket or market garden. If you have mushrooms in your garden, do a daily sweep and remove them all by hand every morning. It is OK to touch mushrooms, even poisonous ones. 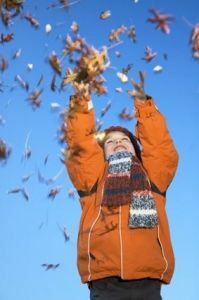 Autumn leaves are fun to play in, but fallen plant debris, like leaves and berries, are easy for young children and pets to eat. It is also the time to prune roses and plant bulbs. Many different parts of a plant can be poisonous. Children should be encouraged to enjoy plants without eating them. Insecticide and fungicide sprays used to ensure plants remain healthy and disease free over winter can also be dangerous if not used with care. Always keep sprays out of reach and sight of children and in their original, labelled, containers. The cooler temperatures cause rodents move indoors, increasing the use of rodenticides by homeowners. Baits can often be picked up by children and pets. In anticipation of colder driving conditions, coolants such as antifreeze are added to vehicles. Antifreeze poses a serious poisoning risk even tiny amounts can be dangerous to children, adults and pets. Autumn means cold, flu and hayfever medications may become more widely used. As people begin to train for the winter sports season, heat rubs and sports gels are used more frequently. This can increase the risk of accidental overdoses and interactions between medicines. It is important when using cold, flu and allergy preparations that the recommended dose is followed and no extra pain relief is taken. Many preparations contain the same or similar ingredients (e.g. paracetamol). Make sure you are not doubling up by checking the packet, and always ask your pharmacist first. Ensure the medication is not left where young children can get access such as in a handbag or on a bedside table. As the cooler weather begins, warm clothing may be retrieved, which may have been stored with mothballs. Children can sometimes mistake mothballs for sweets, and serious symptoms can result from even small ingestions. Many families celebrate Easter with lots of delicious chocolate, as well as enjoying a warming mug of cocoa in the chillier evenings. However, chocolate products are very poisonous to animals, especially dogs, where they can cause serious heart toxicity.